Season’s Greetings, Chicago! Now that the temperature has begun to dip and the sky has started to get a little more gray, New City Moving wanted to take a moment and send you a refreshing story to get your week off to a beautiful start. Perfecting the art of moving is our way of serving the city we love and with the holidays just around the corner, we work all the harder to make sure no detail goes overlooked. But there’s also a bigger picture that we don’t want the festive flurries to white out. There are many families right here in our wonderful city who don’t have the same resources we take for granted every year. Specifically, there are kids out there that may have a heavy feeling that Santa may not be coming this year. So, in typical can-do New City fashion, we gathered our staff of merry elves on Friday afternoon to assemble the greatest toy drive Bucktown has ever seen! After a fueling up on some sumptuous slices at Pete’s Pizza we headed to the only logical place to make Christmas morning the highlight of any kid’s year: Toys R Us. From there, we each grabbed a shopping cart and let our inner child do the driving. We stocked up on stuffed animals, Nerf balls, and Barbies. For most of us it had been years since we’d set foot in a toy store and we’d forgotten what a lighthearted experience it could be. 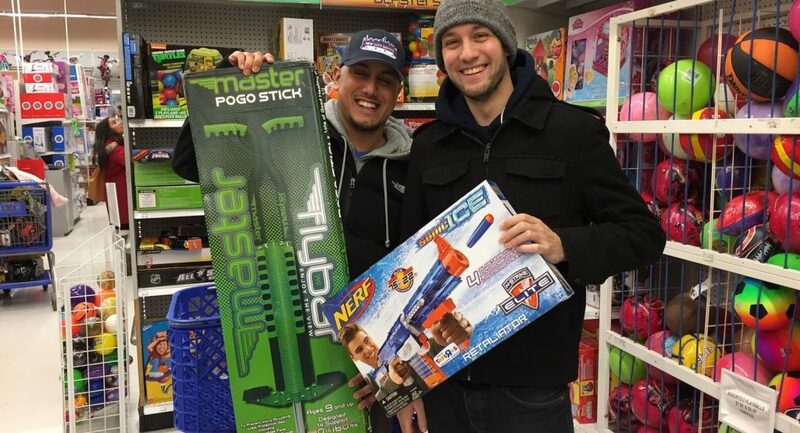 Because game recognizes game, we’d like to offer a huge shout-out to the phenomenal staff at the Toys R Us in Roscoe Village for helping us relive our childhoods and spreading a bit of holiday cheer. From there, our dispatch department sent two great big sleighs to fill with all the goodies. To the unobservant eye, they may have looked like moving vans but they were definitely sleighs. The toys were delivered to two locations: The Ethiopian Community Association of Chicago and the 14th District Police Station at 2150 N. California. The former is a fantastic organization that helps facilitate donations and organize relief for refugees in our city. The latter holds an annual banquet for the children of families of low income housing in the Humboldt Park area. We cannot thank them enough for their efforts and are proud to have contributed to such awesome causes. In the end, New City filled ten shopping carts with a total of 233 toys, spending a little over $4300! It’s easy to think that no Friday will ever quite live up to the one we just had, but that’s simply not true. Giving doesn’t have to be a seasonal cause and we encourage all of Chicago’s communities to come together more often to embody the spirit of joy that not only makes this time of year so special, but makes our city shine. There are all types of organizations to donate to this holiday season, as well as year round. Donating gently used items are just as good as new ones! Here are a few places to consider for your donations. We hope you’re enjoying the season as much as we are!